One year the courgettes I grew in the garden seemed endless. Everytime I went out there were two or three ready to pick. This year I have had two – one, small and perfect which I chopped up raw into a salad. The second had been missed beneath the leaves and was enormous, a small marrow in fact. Courgette and mint soup for that one. 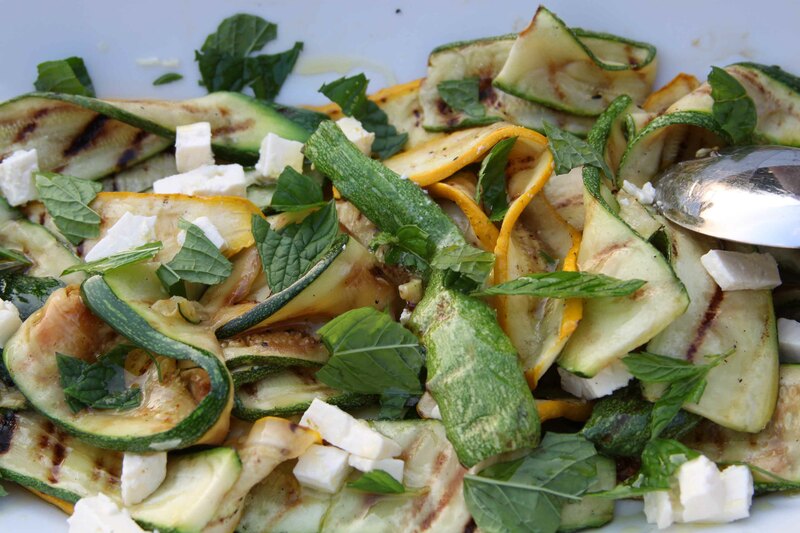 Fortunately though, courgettes are plentiful and cheap in the shops at the moment and this salad is one of my favourite things to do with them. The slight charring can be achieved on the barbeque or griddle pan, whichever suits you. It is this cooking process though that seems to transform the flavour of the courgettes into something delicious that my children will happily eat whilst a steamed disc of the same would fill them with dread. The combination of the salty feta and fresh mint with the lemony dressing completes the picture. We ate this with chicken thighs marinaded in a bit of chilli and garlic then cooked on the barbeque (sorry South African husband, the braai) and new waxy potatoes dug from the garden just before supper. The treat of the brand new freshly dug potatoes makes up for this years disastrous courgette crop! 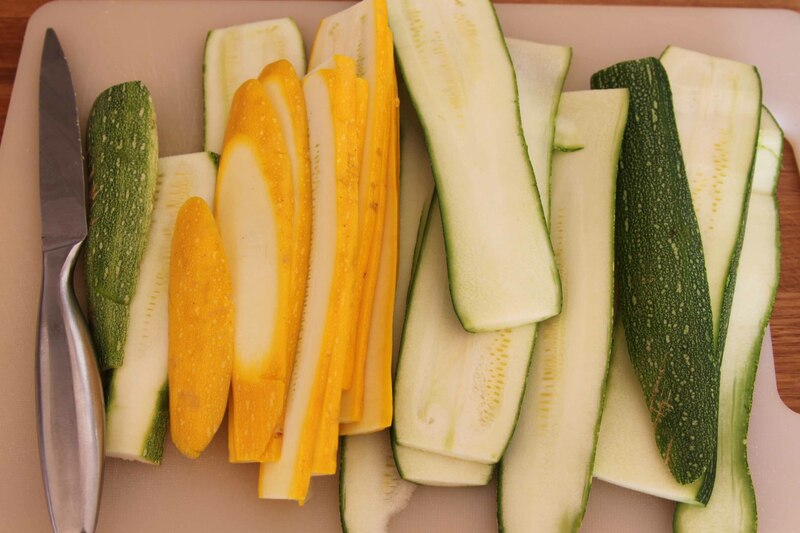 Mix the sliced courgettes with one tablespoon of the oil. It seems very little but they only need the merest coating then griddle or barbeque until lightly charred and floppy. Put aside on a large plate. Mix the remaining oil with the lemon juice, crushed garlic, some pepper and a little salt (remember the feta with be salty). When you have cooked all the courgettes, tumble them onto a large serving plate along with the feta and pour over the dressing. Mix it carefully together and then top with the mint leaves. Enough for 4. So, not a fantastic photograph I’m afraid but this was last nights pudding, it was on the table and I had to get a picture before it got eaten. I have to share it though because it was the simplest, as these freeform tarts or galettes always are, and just fabulous because of the combination of fruit and crispy sweet pastry. Immediately I have to admit that it was bought shortcrust (come on, it is the summer holidays) but that doesn’t matter. I chose nectarines and cherries because I had some a little soft and in need of eating up. I rolled the pastry, my daughter put the fruit on and folded the crust up, we popped it in the oven and it was done. As luck would have it, a chance putting together of ingredients produced something wonderful. I can’t take any credit – it was simply what was in the larder and I needed to make a pud. Serendipity. Preheat the oven to 190 and put a flat baking tray on the shelf to heat. Put the fruit into a bowl with one dessert spoon of caster sugar, give it a mix and leave while you get on. Roll out the pastry into a rough circle or oval. Transfer gently to a tin lined with baking parchment. Sprinkle the middle of the pastry with the flour or ground almonds (this will absorb any excess juice and stop the base of the galette becoming soggy). 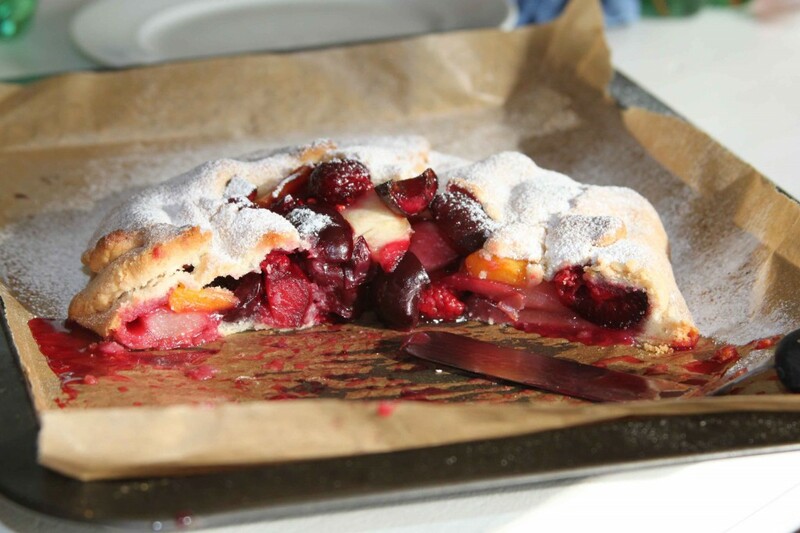 Top with the fruit, fold the pastry edge over the fruit, sprinkle the whole thing with the remaining dessert spoon of sugar. Put the tin into the oven directly onto the baking tray – this will ensure the base gets cooked properly and will be crisp and lovely. Cook for 30-35 minutes until golden. Some juice may leak out which matters not. This was enough for 4 and we had it with cold cream. Vanilla ice cream would be good too. If you have pastry left, make mini versions of this or my lemon and raspberry tarts (June 2013) or just good old fashioned jam tarts. Alternatively of course you could just make a bigger one of these and up the amount of fruit.